Former Punjab deputy CM Sukhbir Badal. Digging deep into allegations of former deputy chief minister Sukhbir Singh Badal and MLA Bikram Singh Majithia bringing to disrepute the sacrilege commission headed by Justice Ranjit Singh, the Punjab and Haryana High Court on Monday made clear its intent to play the recordings of a press conference and another event in the chamber before considering the issuance of notice to the two. The press conference, addressed by Sukhbir, was held on August 23, last year. 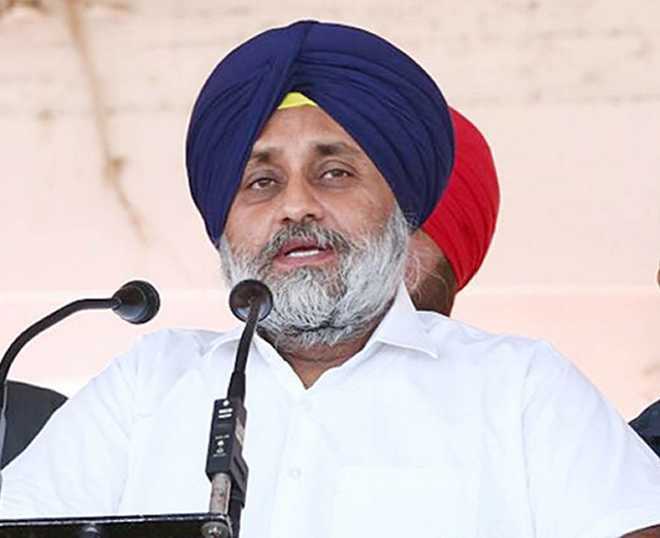 The other recording was of the alleged act of dubbing the commission report as worth Rs 5 during a demonstration outside the Punjab Vidhan Sabha allegedly by Sukhbir, Majithia and other SAD members on August 27, last year. Issuance of notice by Justice Amit Rawal, if at all, would virtually relegate the two to the position of accused on the criminal complaint submitted by Justice Ranjit Singh against them for deliberately and willfully making "false, derogatory and defamatory" statements on public platforms against him. The decision to view the CDs came after Justice Ranjit Singh's counsel APS Deol told Justice Rawal's Bench that secondary evidence, in the absence of primary, was admissible under the provisions of the Evidence Act; and was produced before the Court in the form of CDs after downloading the contents of the press conference from YouTube. Deol also submitted that Justice Ranjit Singh wrote a letter to the channels for recordings of the events. But reply was not received. Justice Rawal, in turn, made it clear that the court would satisfy itself regarding the evidence before proceeding further. At the very onset, Justice Rawal questioned Deol on the filing of a criminal complaint, the nature of offence and the list of witnesses. Justice Rawal also expressed inclination to fix the case for pre-summary evidence. "The court cannot issue summons like this," Justice Rawal asserted. "Pre-summoning evidence is required. The Court would apply its mind and then issue summons." Overcoming the initial hurdles, Deol vehemently contended defamation case was not an answer as sanctity of the commission was to be maintained. It was a "warrant case" and the offence was of bringing the commission to "disrepute", punishable by simple imprisonment for a term extending up to six months. The witnesses included the complainant, two senior public persons, three channels and their reporters. Deol also crossed another legal hurdle posed by Section 65(B) of Evidence Act, which said electronic records was required to be certified by a person occupying a responsible official position for being admissible as evidence in court proceedings. Deol referred to Supreme Court judgment in the case of "Shafi Mohammad versus the State of Himachal Pradesh" to say requirement of a certificate to make an electronic evidence admissible was not mandatory wherever interest of justice so justified.